THUNDER BAY – The Hike for Hospice is Sunday May 5th at Boulevard Lake. This unique national event brings together organizations working in hospice palliative care to raise funds and awareness in their community. All the money raised from the Thunder Bay Hike goes directly to helping Hospice Northwest continue to provide compassionate companionship and services to some 350 clients a year. Those services include Circle of Friends Support Group, respite for families caring for a loved one and bereavement support. The Hikers represent all walks of life, all ages, but they all share the desire to reach out to people dealing with the challenges of life limiting illnesses. Among the Hikers lending support, is award winning local singer song-writer Shy-Anne Hovorka. A friend’s battle with cancer has inspired her to hike. Hovorka and her celebrity team is challenging Aldo Ruberto and his team of city councillors, to raise the most dollars for Hike for Hospice. The goal for this year’s Hike is $40,000. Adding to the sense of community, there will be performances by local entertainers and prizes for individual hikers and teams, provided by our generous donors. The Hike begins with a touching Remembrance Ceremony. Hikers are invited to bring a photograph of someone they wish to honour in a special “Memories Banner”. Drumming and a Flower Release Ceremony, will offer another chance for participants to remember loved ones, before they head out on the Hike. 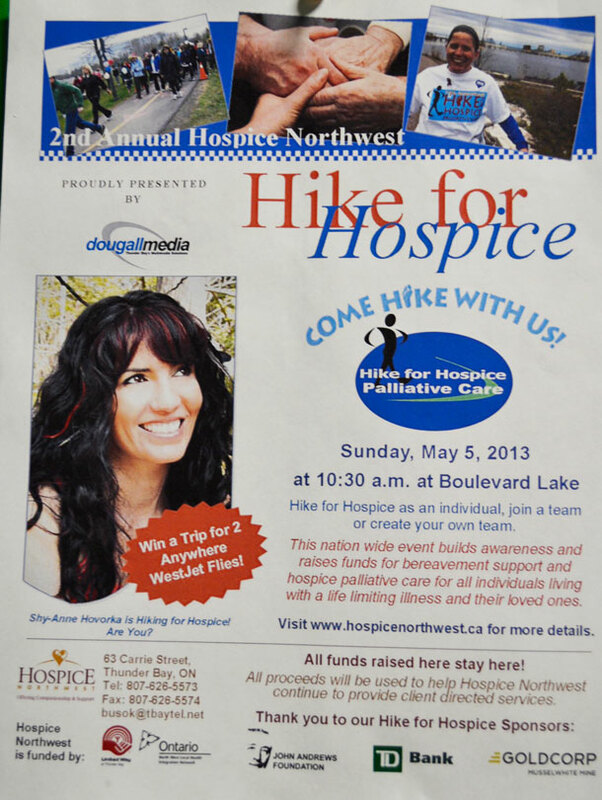 Deadline to submit pledges for Hike for Hospice is Friday May 3. Log on to: www.hospicenorthwest.ca/hike-for-hospice or call the Hospice Northwest office at: 626-5573. 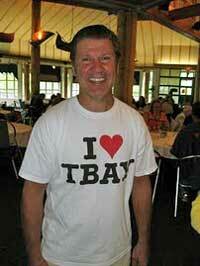 A worthy cause perfect for Thunder Bay’s Giant Heart!